Here are some of my all time favorite baseball tirades. Sometimes baseball players, managers and umpires do not agree on things. To say the least! Watch some "disagreements" on the field and in the club house. Warning! Some of these are rated "R". Let's start with one of the best and most famous. Geore Brett: On July 24, 1983, the Kansas City Royals were playing the New York Yankees at Yankee Stadium. With two out in the top of the ninth inning, the Royals were losing 4-3. 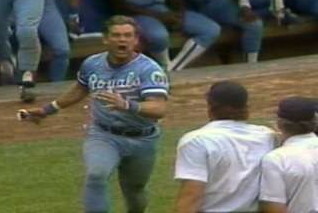 George Brett hit a two run home run off of reliever Goose Gossage the give the Royals the lead. Yankees manager Billy Martin protested that Brett had too much pine tar on his bat. Home plate umpire Tim McClelland ruled Brett out. Since he was the third out, the game was over. The Royals lost 4-3. Kansas City protested the game and American League president Lee McPhail upheld the protest. He ruled that the game would resume with the Royals leading 5-4. The Royals eventually won the game. Watch the angriest human being I've ever seen on a baseball field. Lee Elia: On April 29, 1983, the Chicago Cubs lost a game to the Los Angeles Dodgers. 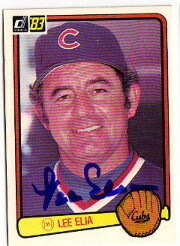 After the game, Cubs manager Lee Elia went off to a handful of reporters in the club house about the Chicago fans. Warning! Lots of profanity. Wally Backman: South Georgia Peanuts Manager Wally Backman gets ejected after one of his outfielders, Doc Brooks, gets ejected. This one is beautiful, haha. Warning Again! Profanity. 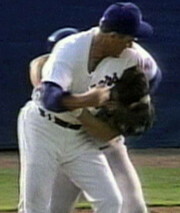 Tommy Lasorda: Los Angeles Dodger pitcher Tom Niedenfuer was fined $500.00 in July of 1982 for throwing at and hitting Joe Lefebvre of the San Diego Padres. The next day, Lefebvre's team mate Kurt Bevacqua was quoted in the newspaper, saying that "the guy they should have fined was the guy that ordered Niedenfuer to throw at Joe. That fat little Italian" Meaning Lasorda. 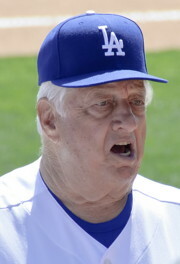 Reporters asked Lasorda what he thought of Bevacqua's comment. Here's his priceless response. Warning! More profanity! 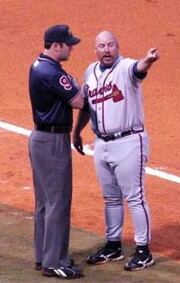 Phillip Wellman: On June 1, 2012, Atlanta Braves Double A manager Phillip Wellman went wild after an umpire's call. This might be the best manager meltdown of all time. Hal McCrae: After a game in 1993, Kansas City Royals manager Hal McCrae was asked if he considered pinch hitting George Brett, who was not in the lineup, in a bases loaded situation. McCrae evedently thought it was a stupid question. Check out the bloody face of one of the reporters near the end of the video. Brett Lawrie In 2012, Toronto Blue Jays batter Brett Lawrie was ejected after disputing a called strike three. 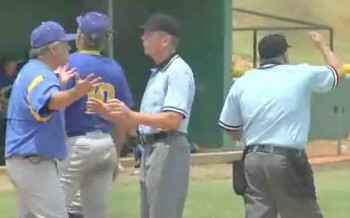 After throwing his helmet at the umpire, Manager John Ferrell was also ejected. 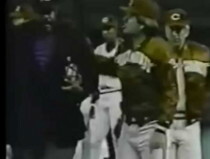 Pete Rose: On April 30, 1988, Cincinnati Reds Manager Pete Rose is ejected for arguing a call at first base. Mookie Wilson of the New York Mets is called safe by umpire Dave Palone. Rose is ejected, fined and suspended for pushing Palone. Earl Weaver: On September 17, 1980, the Baltimore Orioles were playing the Detroit Tigers. Umpire Bill Haller called a balk on Orioles pitcher Mike Flanagan. 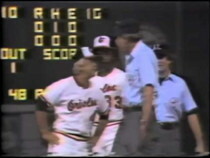 Orioles manager Earl Weaver went nuts! Nolan Ryan And Robin Ventura: August 4, 1993. Texas Rangers pitcher Nolan Ryan plunks Chicago White Sox batter Robin Ventura, who decides to charge the mound. Ryan gets about 6 or 7 good licks in before the benches clear. Wally Backman Again: In 2012, Manager Wally Backman of the South Georgia Peanuts went berserk on his team after a game. Priceless! Warning! More Profanity! Pedro Martinez and Don Zimmer: In game three of the ALCS playoff game in 2003, Roger Clemens of the New York Yankees throws one up and in to the Red Sox Manny Ramirez. 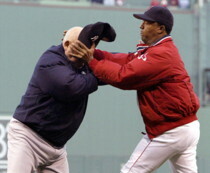 The benches clear and Red Sox coach Don Zimmer goes after Pedro Marinez. Zimmer lost.